Four ways that incompetent salespeople can damage your company, beyond just missing the numbers. Two business dynamics that can make it easy for incompetent salespeople to "hide" for a very long time. The results of a benchmarking study that exposes just how many salespeople are lacking core selling skills. 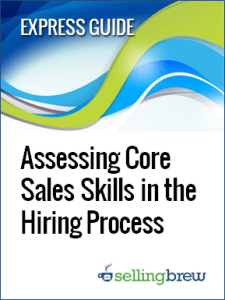 How online sales skills assessments now make it possible for anyone to use objective criteria when hiring salespeople. Bringing a new sales rep onto your team can be a very expensive and risky proposition. And many common onboarding strategies can make things worse instead of better. This guide exposes 10 best practices our research team has found to be most effective. It's not uncommon for 30-50% of a company's customer base to be in some stage of defection. We spoke with Javier Aldrete and learned the new approaches companies are using to recover the revenue they're losing to customer defection and churn. Pipeline analytics is great for reporting on current performance, but it can do so much more. This guide outlines 12 strategies for improving deal probability, velocity and value across every salesperson in your sales operation.